Who else wants bragging rights for having a beautiful Tuscany Style Home? Thousands Now Decorate Tuscan Style Who Never Thought They Could! Discover how YOU can decorate any room in your home Tuscan style, any budget. Find out the secrets to creating genuine Tuscan ambiance utilizing today’s Tuscan home design techniques. Tons of Beautiful Tuscan Decor ideas and plans. With inspiration from the coastal villages of Tuscany, your home will be transformed into an inviting space. The idea is to have rich tapestry of Tuscany culture unfold right in your home. Find out the most cost effective ways to design a Tuscan space. When I receive emails asking where to find particular products, I usually refer them to the places that I go for authentic Tuscan decor. I’m going to show how to find the top notch Tuscan Products, easily. From accessories, to kitchen sinks, to bathroom tile, to chandeliers. Color is so important in Tuscan Design. Loads of tips providing the easiest ways to choose your Tuscan design color palette. With the examples I provide to make your options easier, you will be able to balance the proper shades and tones for each individual space. Tuscan color can be “off” if you don’t select the colors with Tuscany in mind. I will help you color select with ease. One of the most important steps in a design project is Space Planning. I will show you how to simply put your finger on what you want out of your space–from the very beginning, determine the functionality, how to produce proper measurements of the room and furniture you plan to keep so that you can arrange furniture perfectly. Not sure what furniture and accessories will look right in your space? No worries! I will get you up to speed quickly on what Tuscany style furniture really means… to make furniture and accessory selection a fun and money saving experience! Starting a Tuscan Home Design Project looks a lot easier than it actually is! You are busy but you want a beautiful design result. The Ultimate Tuscan Home Decorating Guide takes you from point A to Z in the design processes–Saving you time! Frustrated or Afraid of Getting Started In Your Tuscan Decorating/ Design Project? 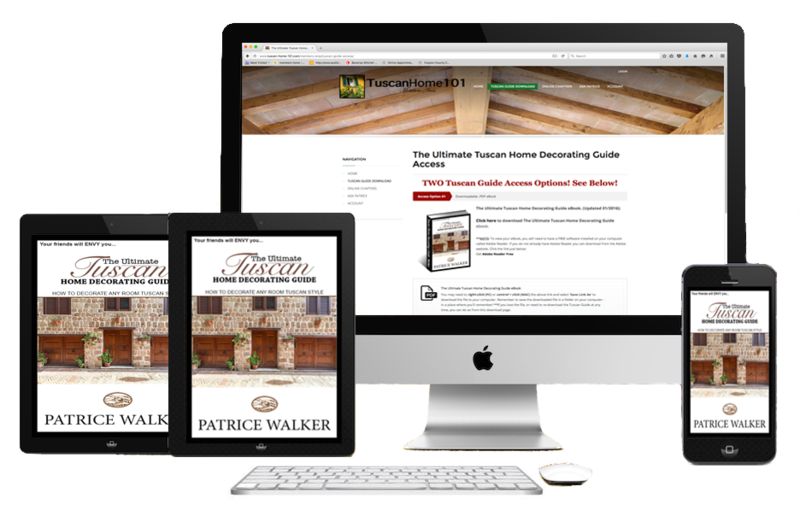 Using my system provided in The Ultimate Tuscan Home Decorating Guide, you will learn how to transform your room into a breathtaking Tuscany inspired villa or farmhouse--and you will ABSOLUTELY LOVE IT! Bonus #1: Unlimited Lifetime Access and Upgrades. Finally, take the guesswork out of your Tuscan design project. You'll learn exactly how to create authentic Tuscan ambiance in your home. Bonus #2: Easy To Follow Space Planning Templates and Worksheets. Gain design clarity. Maximize your room's full design potential. No more decorating overwhelm and color confusion! Here's how to avoid those disastrous, costly design mistakes! Bonus #3: Tuscan Home Design Team Exclusive Direct Access. It's like having designers in your pocket. Once you're ready to start your design project, we'll be there to guide and support you. Since Tuscan decorating ideas are hard to find, it makes it difficult to keep up with current Tuscan Interior Design styles. Then, the lucky ones, hard searchers and the totally driven ones discover that there truly is a Tuscan design guide that will provide great ideas, that can get you the quality results you are looking for. And it is all available in one downloadable eBook. So congratulations! Homeowners are looking for the easiest and finest ways to bring the air of Tuscany into their abode– using the highest quality products, and saving money at the same time. 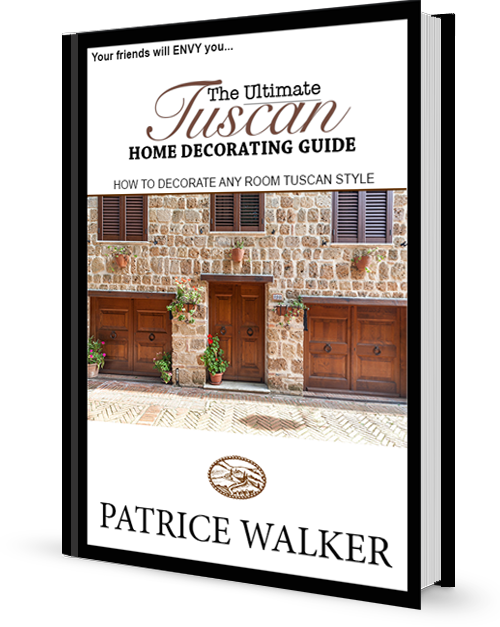 The Ultimate Tuscan Home Decorating Guide is a tool that compiles a no-nonsense, decorating ideas formula, for creating a fresh Tuscan feel to any room. And yes, I will even show you how to design a Tuscan Home Theatre! 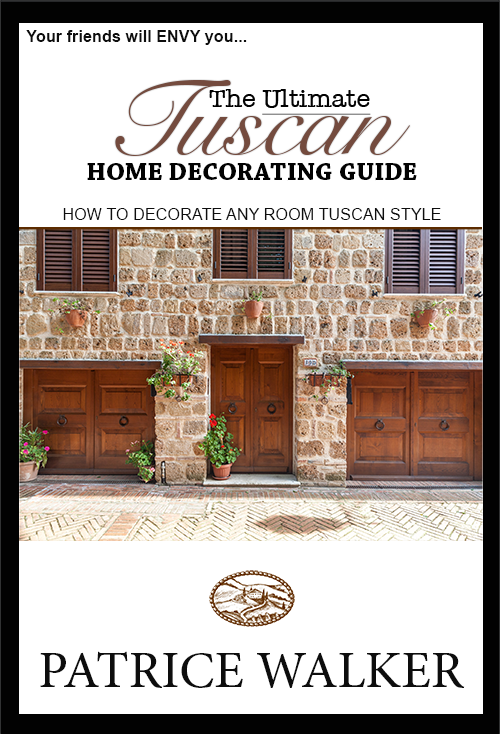 My Tuscan Decorating eBook is a step-by-step guide incorporating only the top Tuscan Decor products. No more searching to find the perfect authentic Tuscan accessories. Over the years, I have assisted so many people with their Tuscan decorating. Countless numbers of people have emailed me for advice. I have to admit, I’ve spent a heck of a lot of time trying to find the best colors, fabrics, flooring, counter tops, greenery, lighting… It truly was a lot of fun creating this book… I’ve seen it and done it all. "Your Tuscan decorating guide is great! I found it at the right time. My husband and I visited Florence and fell in love with the villa we stayed in! We ended up redesigning the entire first level of our home! Feels just like our vacation! Thank you so much!" "I really enjoyed the simple room measuring templates and the color selection was a lot easier than I thought it would be. It's such a rinse and repeat process. We've completed our living room, now on to the kitchen!" "The Ultimate TUSCAN HOME Decorating Guide" is usually sold for $67.00 USD. Complementary Lifetime GOLD Level Membership Access To the Tuscan Home 101 Members Area! You are just moments away from learning how to Create YOUR OWN Tuscan Retreat. I will show you tons of up-to-date tips and techniques that Interior Designers often recommend to their clients! Just as I have for others, by way of clear and direct Tuscan style ideas– The Ultimate Tuscan Home Decorating Guide is specifically designed to walk you through the art of applying Tuscany style decor to any room in your home. Whether you are thinking of building, or have an existing home that you would like to bring back to life, brush your shoulders off and enhance your family’s lifestyle. Tuscan Decor: My design inspiration comes from the beautiful landscapes dotted with rich olive groves and vineyards of Tuscany. Discover how to transfer those special gifts into your own unique Tuscan decor scheme.